Just in time for crab season, this crab casserole makes a wonderful dinner. Pre-heat oven to 450 degrees. Coat a 10x10 oven proof casserole dish with cooking spray. Melt butter in skillet or medium saucepan over medium heat, saute garlic and onions until tender. Whisk in flour, slowly add milk, sherry and red pepper flakes, stir constantly. In a medium skillet over medium heat, cook mushrooms until golden. Set aside. In a small bowl mix breadcrumb and Parmesan cheese. 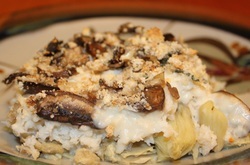 Layer artichokes on bottom of prepared dish, then crab, sauce, mushrooms, and finally the cheese/breadcrumb mixture. Cook uncovered 30 minutes or until hot.